After a week of failed recipes and feetless macarons I wanted to make something easy, quick and satisfying. For me, breakfast is the quintessential meal for indulgence. Think about it. You eat a lavish, grand breakfast in the morning and you’re satisfied throughout the rest of the day. No snacking in between meals, no cravings for chocolate or chips in the evening. The whipped egg whites makes the batter (and eventually the cooked waffles) incredibly light. The waffles are so light and dense, you almost can’t lift them of the waffle iron without breaking them. Which is a small price to pay for a breakfast this delicious. Rating: 4- out of 5. - In a medium bowl, combine the flour, baking powder and cocoa powder. In another bowl combine the melted butter, whole milk and egg yolks, whisk to combine. Pour the wet mixture into the dry and mix until smooth. - In the bowl of an electric mixer fitted with the whisk attachment, whip egg whites until stiff peaks form. Add the brown sugar and continue whopping until stiff. Lightly fold the whipped egg whites into the batter. - Heat waffle iron and spray with nonstick cooking spray. For each waffle, pour the amount recommended by the manufacturer and bake as directed. (around 4 tablespoons per waffle, baked for 3 minutes) Top with pure maple syrup, whipped cream or anything to your liking. Yummy! I love homemade waffles. The frozen ones just can't even compare. And I love eating sweet filling stuff in the morning(: That's why I bake my dessert in the morning so I can eat it for breakfast. You just have to torture me with this picture don't you! :'( It looks so good! Yum! Perfect for the crazy sweet craving I get in the morning. This looks delicious! I adore waffles. Especially if they look like this. ;) I hope you had a wonderful day! Wow! These look to die for!! You're so right! I'd be very satisfied and content with this in the morning. These look fab, the egg whites at the end always make all the differance. Be wonderful with strawberries! This looks so good...I love the idea of using eggwhites for a lighter and crisper waffle...which is the only way I make my regular waffles. I can't wait to try your chocolate waffle. 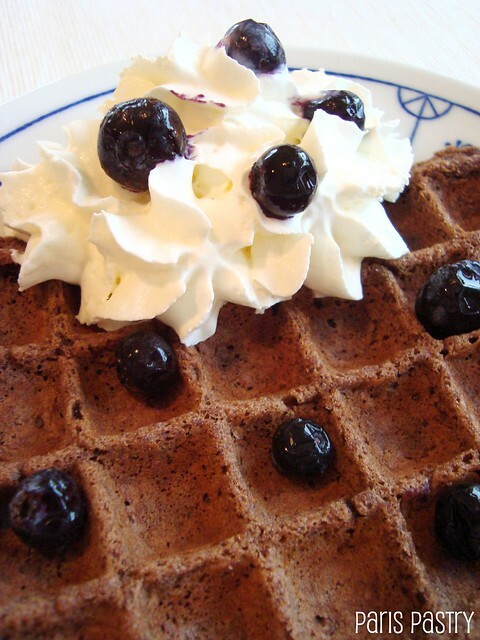 Oh wow!Chocolate waffles are going to be a regular additions to my breakfast menu!! These look light and satisfying. Time to break out my dusty waffle-maker! it looks so delicious! 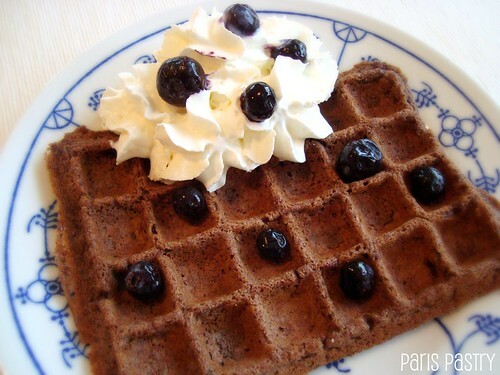 I've never done chocolate waffles before but i will after seeing those! !